A cyclo-ergometer exercise test was performed on this 60-year old male patient suffering from heart failure post infarction. 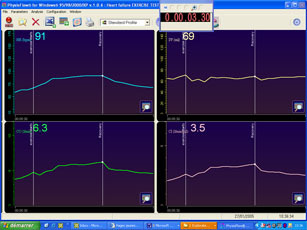 The patient performed 59% of maximal heart rate at 30 watts. The test had to be stopped at the end of this step due to severe dyspnoea and fatigue. No increase in stroke volume was observed and cardiac output has not reached twice the resting value. These two signs indicate that the cardio-vascular function of this patient could not adjust even to moderate workloads. The diagnosis is severe heart failure in spite of an acceptable resting cardiac index of 2.2 l/min/m².